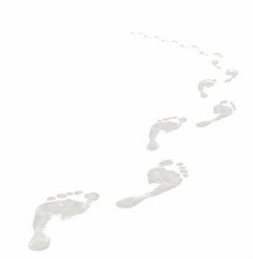 I've been dancing since 2001 and studying ATS® since 2004, and was originally self taught in American Tribal Style® with my tribal journey venturing into the Gypsy Caravan format with Barefoot. I studied Gypsy Caravan Collective Soul with Paulette Rees-Denis, founder and Director of Gypsy Caravan, gaining my Level 1 and Level 2 Certificates in 2008 and 2009, then in 2011 I gained my FCBD® General Skills Certification from Carolena Nericcio-Bohlman, flew to Sweden in 2012 where I gained my Teacher Training 1 Certificate from Carolena, and was honoured at becoming a FCBD® Sister Studio. I continue to study in the annual FCBD® SSCE programme and take regular online classes with FCBD®, as well as taking any opportunity to study with members of FCBD® when they visit the UK and Europe. In 2016 I travelled to San Francisco with other Ashnah members to visit the 'mother-ship' and studied with all the FCBD® teachers and Carolena at Homecoming. Along with Rita and Philippa, I'm one of the original founders of Ashnah, formed in 2008, where I've taught and directed all the past and present troupe members, and as well as teaching in Abingdon, I now also teach classes in Oxford and Swindon. 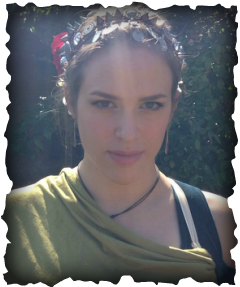 I've always had a love of art & craft and am often found making costumes for the group and other dancers, and having had a fascination with IT for years, I'm the Ashnah webmaster and also create websites for other people. If I'm not found at my sewing machine or computer, I'm often swimming lengths or doing yoga. I started bellydancing quite by chance in 2002 at Abingdon Dance Studios, where I was taught by Liz Selleck. It's there I met Kay and Philippa with whom I went on to start up what has now become Ashnah. Middle Eastern dancing has been a true revelation to me and I haven't looked back since, immersing myself in all its aspects, and totally loving it. 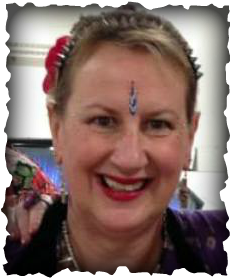 For the past few years, and guided by my teacher and troupe member Kay White, I've gently been won over to American Tribal Style® (ATS®). I've been focussing on it, forever striving towards my own dance goals, and in 2014 achieved FCBD® certificates in General Skills for Classic and Modern, as well as Teacher Training, presented to me by Carolena Nericcio-Bohlman, and following the training I was honoured at becoming a FCBD® Sister Studio. The group's challenges include organising classes and workshops, even attend African drum classes which we use in live performances! In both dance arts, my gratitude goes out to all the mentors I've encountered and am yet to meet. I've always loved dancing, being besotted with ballet as a child but giving it up when it became too 'uncool!' I first started Middle Eastern dancing with Tina Hobin and thought it may be fun for a 10 week course. That was 17 years ago!!! I then took classes with Liz Selleck at Abingdon Dance Studios where we performed as Eshta. We were some of the first people in the UK to take IDTA bellydance exams ... (my first trophy says Freestyle). It was here that I met Kay and Rita, and many years later we decided to go our own way. This has been the best fun and has allowed us to expand our style, and in 2014 I achieved my FCBD® General Skills certificates in Classic and Modern ATS® from Carolena Nericcio-Bohlman. I started classes in 2013, and was invited into the troupe a year later - I'm completely obsessed! Probably due to my Romani Gypsy heritage, I have always had a natural leaning towards the arts, particularly dance and craft. I have always loved dancing, simply for the pure joy of it, but never thought to take up lessons until one night, when I had a dream that I was performing as a fantastic and colourful bellydancer! Being one to look for the deeper meaning in dreams (I also studied Psychology), I enrolled on Liz Selleck's Egyptian Belly Dance course at Abingdon Dance Studios the next day! Although I didn't persist with formal lessons, I continued to practice by incorporating what I had learned into my own natural style of dance. I hadn't even heard of American Tribal Style® dance until I found Kay's lessons in Abingdon, but the more I discovered about the movement, colours, costume, jewellery etc the more I realised that this is most definitely the style for me, and in 2014 I achieved the FCBD® General Skills Classic and Modern certificates presented by Carolena Nericcio-Bohlman!! Having what might be described as a 'bohemian' appearance anyway, I didn't need to buy much to start my costume off, as I already had numerous suitable accessories to wear. However, this did not save me from the whirlwind of tribal shopping that followed - it is actually impossible to have too many bracelets and flowers! Cat joins us as our newest member - bio to come!! 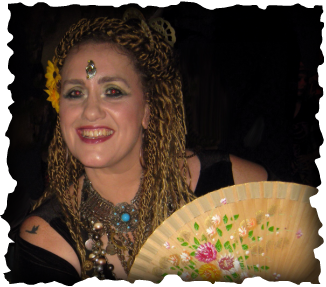 I started taking American Cabaret and Tribal Fusion belly dance in 2011 when I was at Penn State University, and after a semester abroad, I returned in the summer of 2012, where I met Rosie, a former student of Divine Chaos Tribal, who was teaching the basics of American Tribal Style®. Since taking Kay’s classes, I’ve noticed a dramatic improvement in my performance, and the numerous opportunities to perform has benefited my leading and pushed me out of my comfort zone when on stage. I hope to take FCBD® General Skills and Teacher Training in the near future, and to be with Ashnah for a long time. 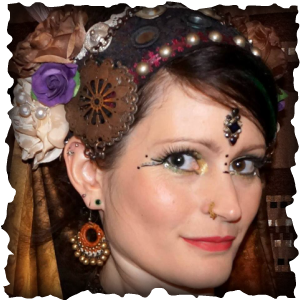 Aside from ATS® I continue to follow and practice Tribal Fusion belly dance, and I have a great passion for creating belly dance costumes, and costuming in general – one of my main hobbies is sewing period costumes and cosplay.